4 ENOCH: Enochic Studies. A nice summary of the history of research by Gabriele Boccaccini. Related: I have posted a paper on the Enochian revelations of John Dee and Edward Kelley here. Incidentally, 4 Enoch is an online encyclopedia of Second Temple Judaism, not another pseudepigraphic Enochic book. Cross-file under "News you can use." THE TALMUD BLOG: Between Furniture in the Mishnah and the Mishnah on Furniture: On Kirshenbaum, ‘Furniture of the Home in the Mishnah’- Guest Post by Yair Furstenberg. THE BIBLE PLACES BLOG: New Article on Authenticity of the James Ossuary. The issue, of course, is not the ossuary itself, which everyone agrees is ancient. Rather, the question is whether the inscription, or all of the inscription, is genuinely from the first century. Background here and just keep following the links back. Though Crowe's Noah has a dirty grey beard, the Old Testament figure who was ordered by God to build an ark, is often depicted with a long white beard. This in itself is no evidence of albinism but some people have seized on text from the Dead Sea Scrolls which elaborates further. 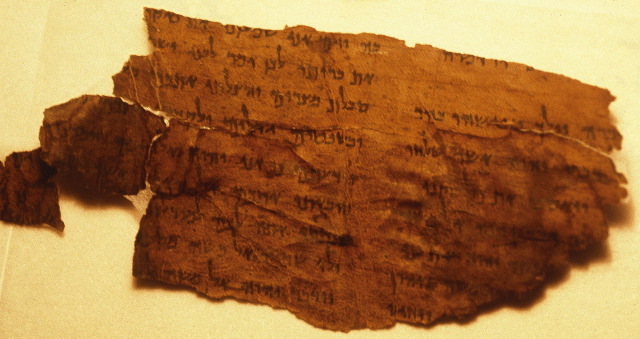 Discovered between 1946 - possibly 1947 - and 1956 in a cave east of Jerusalem, they are thought to contain the earliest known manuscripts of some parts of the Hebrew Bible. In the scrolls, there is a description of Noah as a child "the flesh of which was white as snow, and red as a rose; the hair of whose head was white like wool, and long; and whose eyes were beautiful. When he opened them, he illuminated all the house, like the sun". It doesn't exactly sound conclusive. So, sorry, no albino Noah. Also, regarding the quote above, the Dead Sea Scrolls were found in eleven caves, not just one. The Qumran Genesis Apocryphon also tells this story, but unfortunately the section parallel to this one is very fragmentary. More on that passage here. And background on the Noah movie is here and links. Among other things, Golb has argued that his email impersonation of the NYU professor was parody protected by the First Amendment. As Hustler Magazine makes clear, acts of parody are entitled to broad constitutional protections. The more difficult issue presented by the Golb situation, however, is whether his impersonation can be considered parody. That turns in large part on whether a reasonable person would have realized the emails were not actually from the professor, as the jury in Hustler Magazine concluded that a reasonable reader would not have thought the Falwell interview to have been genuine. Yes, that sums up the issue pretty well. By the time the Talmud was compiled, the Alexandrian synagogue, like the Temple, was long gone, also having been destroyed by the Romans. But the rabbis’ account of what happened to it reveals the curious historical amnesia that we see again and again in the Talmud. The Talmud is, of course, deeply concerned with the past: There is no limit to the rabbis’ curiosity about the smallest details of the Temple and its rituals. But the Temple as the rabbis imagine it is essentially static, a world out of time in which the same actions eternally recur. About the wider historical context—the world of empires and states, wars and politics, which is always changing—the Talmud is surprisingly incurious, considering how deeply Jewish fate had been affected by it. The rabbis had the biblical stories and some fragmented folk traditions; beyond that, they felt no need for accurate history. The contrast with a historian like Josephus, who portrays the ancient Jewish world as a hotbed of political intrigue, is striking. MAYBE: "Noah": A Post-Modern Midrash (Fr. Robert Barron, The Catholic World Report Blog). I suppose it depends on how you want to define midrash. “Noah” is best interpreted, I think, as a modern cinematic midrash on the Biblical tale. The midrashim—extremely popular in ancient Israel—were imaginative elaborations of the often spare Scriptural narratives. They typically explored the psychological motivations of the major players in the stories and added creative plot lines, new characters, etc. In the midrashic manner, Aronofsky’s film presents any number of extra-Biblical elements, including a conversation between Noah and his grandfather Methuselah, an army of angry men eager to force their way onto the ark, a kind of incense that lulls the animals to sleep on the ship, and most famously (or infamously), a race of fallen angels who have become incarnate as stone monsters. These latter characters are not really as fantastic or arbitrary as they might seem at first blush. Genesis tells us that the Noah story unfolds during the time of the Nephilim, a term that literally means “the fallen” and that is usually rendered as “giants.” Moreover, in the extra-Biblical book of Enoch, the Nephilim are called “the watchers,” a usage reflected in the great hymn “Ye Watchers and Ye Holy Ones.” In Aronofsky’s “Noah,” the stone giants are referred to by the same name. The film certainly is an imaginative retelling, but I haven't heard much evidence that the elaborations are based on hints elsewhere in scripture, as with ancient Jewish midrash. Once again, someone who should know better garbles the Watchers myth. In the Book of 1 Enoch the Watchers are angels who fathered the giants on mortal women. The Nephilim are the giants, not the Watchers. And the hymn is based on the "the Watchers and "the holy ones" mentioned in Daniel 4:14 (cf vv. 10, 20; English vv. 17, 13, 23). According to the Enochic mythology (1 Enoch 14:23, 39:12-13), some of the Watchers remained in heaven unsleepingly guarding the throne of God, and this is likely assumed in Daniel, but the reference is to the passage in Daniel, not 1 Enoch. Earlier posts on the Noah film are here and links. Lawsuit over the ten plagues? OF COURSE HE DOES: Egyptian Columnist Apparently Wants to Sue Israel Over…the 10 Plagues (The Blaze). Despite the date of the article, this is not an April Fool's joke. MEMRI has a translation of some of Mr. Al-Gamal's article dated 20 March. The basic concept isn't new. Back in 2003 I noted a proposal made, apparently in earnest, by the dean of the faculty of law at Egypt's Zagazig University to sue Israel over gold looted during the Exodus. Cross-file under "Can't make it up." SAD NEWS: According to Wikipedia and Jacob L. Wright on Facebook, Prof. Rolf Rendtorff passed away yesterday. I do not yet have any further information. His important work on Pentateuchal studies is well known. There is more about him in a post by Deane Galbraith at the Dunedin School blog celebrating his birthday in 2010. Requiescat in pace. As I was about to press "publish," Dan McClellan posted the following on Facebook: Heidelberg: Rolf Rendtorff ist tot. FILMCHAT: No, Noah is not Gnostic. (Say that ten times fast!) (Peter T. Chattaway). Chattaway's post is in response to a blog post by Dr. Brian Mattson, Sympathy For The Devil, which argues that the film is Gnostic. As to whether Kabbalah is "Gnostic" or not, it really depends both on what you mean by Gnostic and which texts in the vast sea of Kabbalah you are talking about. If you take Gnosticism to mean a system of thought that assumes that the spiritual elite possess crucial secret knowledge that gives them salvation or supreme spiritual authority, then Kabbalah is pretty much Gnostic. If you take Gnosticism to mean a radically dualistic worldview in which the universe is a war zone between good spiritual forces of light and evil spiritual forces of darkness, then at least some Kabbalistic thought is Gnostic. But if by Gnosticism you mean acceptance of the demiurgic myth (that an evil or at least imperfect secondary creator, the demiurge, created our material world, and that this material world is fundamentally evil and must be escaped by the spiritual elite), then Kabbalah only plays with the idea. One example of a rather Gnostic (in all three senses) Kabbalistic text is the Treatise on the Left Emanation, written by R. Isaac ben Jacob HaCohen in Castile in the 13th century. It has typically Gnostic-sounding emanations of spiritual beings, some good and some evil (with the main focus on the evil ones), and it includes a primordial threefold emanation of successive creations, each more evil than the last and each having to be destroyed. All that sounds pretty Gnostic, although there is no clear demiurge behind the preliminary evil creations, and they are distinguished from our world. But from what I know about Kabbalah, which is not all that much, this text has an untypically Gnostic inclination. More on the Noah movie here and links. UPDATE (3 April): The two bloggers noted at the beginning of this post have continued the discussion. See Chattaway's post for updates. And Loren Rosson weighs in against Mattson's claim about Gnosticism in Noah here. Be aware that there are lots of spoilers. ROBERT CARGILL: No, no, you DIDN’T find the Holy Grail. An impressive monastery dating to the Byzantine period was discovered at the entrance to Hura in the northern Negev during the course of an IAA salvage excavation for the purpose of building an interchange on Highway 31, at the initiative of the Netivei Israel Company. The structure, measuring 20 × 35 meters, is divided into halls built along an east–west axis, the most outstanding of which are the prayer hall and dining room due to the breathtaking mosaic carpets revealed in them. The prayer hall is paved with a mosaic on which a pattern of leaves is vibrantly portrayed in blue, red, yellow and green colors. The dining room floor is a colorful mosaic pavement depicting floral motifs, geometric decorations, amphorae, baskets and even a pair of birds. According to Daniel Varga, excavation director on behalf of the Israel Antiquities Authority, “It seems that this monastery, located near the Byzantine settlement of Horbat Hur, is one monastery in a series of monasteries situated alongside a road that linked Transjordan with the Be’er Sheva‘ Valley”. 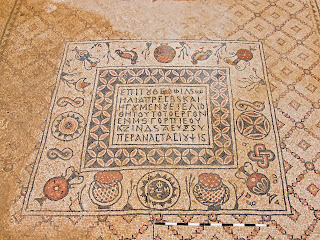 The mosaic carpets also include four Greek dedicatory inscriptions denoting the names of the monastery’s abbots: Eliyahu, Nonus, Solomon and Ilrion, and the dates when the pavements were constructed in the different halls. These inscriptions also aided archaeologists in dating the monastery to the second half of the sixth century CE. One of the inscriptions is bi-lingual. In addition to the Greek there is also a section of the inscription that is written in the Syriac language. The entrance to the monastery was located in the west. The monastery’s western wing, which is divided into four service rooms, is paved with a white mosaic, much of which was destroyed following the collapse of the building at the end of the Byzantine period. Various pottery assemblages were discovered during the excavation of the monastery. These include large storage vessels such as different kinds of amphorae and jars, cooking pots, kraters and bowls. In addition, numerous and sundry glass vessels ascribed to the Byzantine period were discovered, as well as coins. These finds indicate there was a rich material culture in the monastery. The Israel Antiquities Authority, together with the Netivei Israel Company, Hura municipality and Wadi ‘Attir Association, plan on relocating the monastery, including its mosaics, to the Wadi ‘Attir agricultural/tourism project adjacent to Hura. 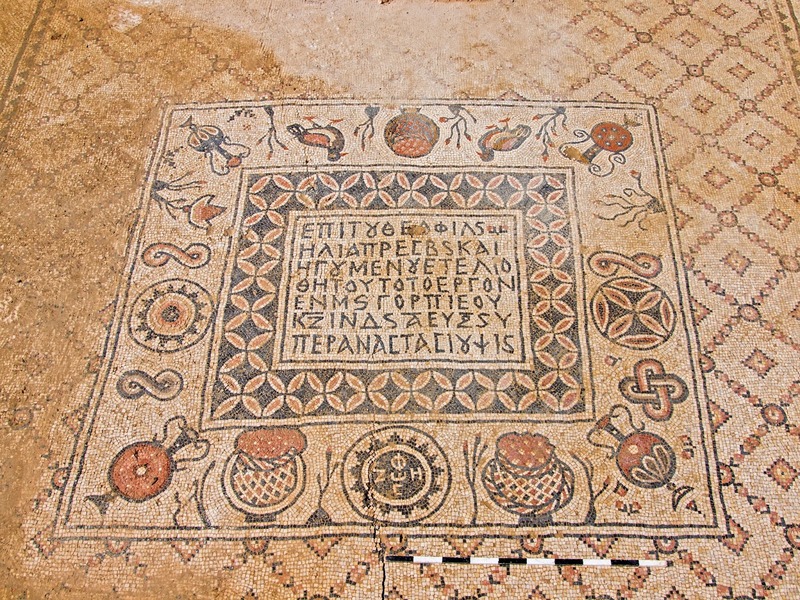 Photo of mosaic with Greek inscription (photo title: חדר האוכל ["dining room"]) by Assaf Peretz, courtesy of the Israel Antiquities Authority. For five more photos, follow the link above. For other ancient mosaics in Israel and nearby, see here and here and links. CONGRATULATIONS TO THE SYRIAN ORTHODOX CHURCH: US Orthodox bishop becomes Patriarch of Syrian church (Ecumenical News). Background here. Cross-file under "Syriac Watch." HAARETZ: Word of the Day / Pilpel: How Christopher Columbus' mistake confounded early Israeli cooks. Ask your spouse to pick up 'pepper' and you'd better be specific, thanks to competing explorers giving the same name to very different plants. The Hebrew word for pepper is pilpel. The story of a geographical mix-up that wound up confusing two categorically different plants starts in India, the source of black pepper, where it was called pippeli. The spice was brought to the Middle East by Persian merchants in the mid-first century BCE, where Jews encountered it for the first time in its Aramaic form - pilpel. That is the name of the pepper in the Mishnah and the Talmud and that is its name to this very day. Meanwhile, their neighbors, the Spanish, were seduced by an unknown Italian named Christopher Columbus into trying to reach India from the other direction – head west, circle the globe and reach the pepper-rich coast from the east. Remember, they didn't know about the American continent and Columbus sailed right to it. Not that he understood where he was. He didn’t find Indians or pepper, but believing that he had, he called the natives ‘Indians’ and their hot spice - the chili - pepper, though that fruit and the black seeds we know as pepper are totally unrelated. And the situation becomes even more complicated in Hebrew. Columbus's mistakes have been disquietingly influential. SETH SANDERS: The Republic of Letters in the Babylonian and Second Temple Periods. Decades ago, scholars like Michael Stone pointed out ways that the intellectual milieu of the Aramaic Enoch literature was Mesopotamian. The question, as scholars like Mladen Popovic emphasize, has always been exactly who shared what with whom, how. In recent years scholars have been getting more specific about who was writing what, when in the Babylonian and Second Temple periods. THE TIMES OF ISRAEL: Filmmaker Simcha Jacobovici sues academic for libel. The ‘Naked Archaeologist’ to face off against former IAA curator Joe Zias in a Lod courtroom in early April. As noted in the article, Jacobovici often blogs for the Times of Israel. As I've said before, it is up to the court to rule on the charges, but I have commented on the background of the case here and links. BUSTED: Police confiscate ancient coffins from tomb raiders in Jerusalem (Daniel K. Eisenbud, Jerusalem Post). 2,000 year old coffins containing Jewish bones, artifacts plundered from burial cave near Jerusalem. Over 2,000 years following their entombments in a Jerusalem cave, 11 ossuaries dating back to the Second Temple period containing the skeletal remains of members of a Jewish family were stolen by Palestinian looters for sale to Jewish buyers on the black market. As a result, the two Arab men who stole the chests remain in jail, while the two Jews who colluded with them to buy and then sell them are under house arrest, the Antiquities Authority said Monday. Several of the ossuaries had their lids taken off, exposing the delicate bone fragments of each person. However, only two of the chests had the person’s name inscribed in Hebrew on its side. New ossuaries from Jerusalem are always an exciting find, assuming they are genuine. And the circumstances here certainly point in that direction. But its a pity their provenance and archaeological context are now lost. Well done to the police who spotted them. The Journal of Ancient Judaism invites submissions for a special issue devoted to Jews in the ancient Mediterranean, outside the land of Israel and its environs, from the early fourth to the early seventh centuries. We particularly invite articles that identify and interrogate evidence for Jews and Jewish communities in localized geographic areas, asking a range of evidentiary, historical, and historiographic questions. We welcome work about their social networks, including communications and relations between such communities, as well as investigations of their location within the larger late antique and early medieval Mediterranean. We especially encourage contributions that combine engagement with historiographic and theoretical concerns with the surviving evidence, including material evidence. We invite submission both of completed manuscripts and of detailed proposals (500-750 words). All articles will be peer-reviewed according to the Journal’s usual practices. Completed manuscripts may be no longer than 7500 words, including footnotes. The Journal will consider including images as space permits. Please email all proposals, as both Word docs and PDFs, to Maxine Grossman (mgrossma@umd.edu) and to Ross Kraemer (Ross_Kraemer@brown.edu) no later than August 1. Completed manuscripts are due by June 1, 2015. Authors with questions about the suitability of particular topics are welcome to email Ross Kraemer, guest editor of the issue. Style and formatting should follow the guidelines found on the JAJ website (http://www.v-r.de/en/magazine-2-2/journal_of_ancient_judaism-500060/#section_ausfuhrliche_informationen), and on the back of any issue of JAJ. Hebrew text must be in the SBL Hebrew font, while Greek text may be in any unicode font. The issue is currently planned to appear in 2016. PHILOLOGOS: Was Daniel's ‘River of Fire’ Really the Milky Way? Was Daniel actually referring to the Milky Way? When one considers that his millions of God’s “attendants” must have been angels and that in his age — which is to say, in the second-century BCE — the stars were commonly thought to be angelic beings, he quite possibly was. What other part of the sky is so packed with stars? The rabbis of the talmudic period clearly thought that the River of Fire, far from belonging only to Daniel’s vision, was an objective feature of the heavens. In the talmudic tractate of Hagigah, for example, there is a belief attributed to the renowned Babylonian sage Rav: “Every single day, ministering angels are created from the River of Fire and sing [before God], and cease to exist.” Elsewhere in the same passage, the somewhat different view is ascribed to Rav that the stars of this river are drops of sweat fallen from the attending angels as they rush about, serving their Maker. Of course, although there may be a distant echo here of the sky-spattering drops of Hera’s milk, this still doesn’t prove that Rav was identifying the River of Fire with the Milky Way. Confirmation of such an identification comes from another passage in the Talmud, this one in the tractate of Berachot, where Rav’s contemporary and fellow Babylonian Shmuel is quoted as saying, “If the tail of Scorpio weren’t in the River of Fire, no one stung by a scorpion would ever live.” Shmuel was a star watcher — “I know the paths of heaven as well as I know those of [his hometown of] Neharda’a,” he boasts in the same place in Berachot. And while it isn’t quite clear what he had in mind (does the sweat of angels magically mitigate the effects of a scorpion’s sting on earth? ), the tail of the constellation of Scorpio is indeed just inside the Milky Way. Cross-file under "Asking the important questions." THERE ARE ENDLESS REVIEWS OF NOAH and there's no point in trying very hard to keep up with them, but as the whim hits me I will note some from time to time. Here are two recent ones. By J. Hoberman in Tablet Magazine: Darren Aronofsky’s ‘Noah’ Is a Hot, Wet, Cinematic Mess. It rains and rains in the most eccentric Old Testament adaptation, and most Jewish biblical blockbuster, ever made. Lots of spoilers in this one. I haven't seen the film yet, but what I've read about it sounds more this-decade forgettably trendy than particularly Jewish. But I'll keep an open mind until I do see it. In a few chapters, the Bible describes a strange primordial world in which people live to be hundreds of years old, extraterrestrial beings invade Earth, and a wrathful God speaks to the devout while obliterating the rest of humankind. There’s enough here not just for a lifetime of self-published books explaining the true origins of humanity — were the Nephilim, in fact, “ancient aliens”? — but also for a great Hollywood movie. What’s better fits the blockbuster aesthetic than ancient landscapes mixed with sci-fi speculation, sword-and-sandals action with Lovecraftian horror? Despite the disappointments of similar projects — the “Stargate” flicks, say, or Ridley Scott’s “Prometheus” — it’s a movie I’d like to see. Unfortunately, Darren Aronofsky’s “Noah,” starring Russell Crowe in the title role, is not that movie. Some of the most destructive and anguishing damages this observer was briefed on at Palmyra are to the Temple consecrated in CE 32 to the Semetic [sic] god, Bel. He was worshipped at Palmyra with the lunar god Agilibol and the sun god Yarhibol and this triad formed the center of religious life in Palmyra and the widespread Palmyrrene culture. The Director of Palmyra’s very impressive Museum, Dr. Khalil al Hariri, showed this observer more than one hundred priceless artifacts that had been stolen by rebels and recovered over the past two years from hiding places. This was mainly accomplished with the help of the local Syrian Nationalist population who refer to themselves as Palmyrenes. Sometimes risking sniper fire or revenge attacks, local citizens continue to collect and report to authorities the stolen treasures. These and many other antiquities are now secured due to their efforts. As a result partly of citizens vigilance and the far-sightedness of the Syrian government, and the lessons learned from Iraq and the Baghdad Museum, all of Syria’s 32 Museums, as well as 80% of all antiquities housed inside the local Palmyra Museum were buried secretly early in the conflict and as of today, none of the storage vaults have been discovered or damaged, with locals keeping secret what they know. Heavy metal doors have also been installed at the entrances of Syria’s Museums with security augmented by government forces and volunteer local ‘neighborhood watch’ committees comprised of ordinary citizens. There's lots more on Palmyra here and links. PERSEPOLIS ARCHIVE UPDATE: News: Judge: Persian artifacts can't be used to pay survivors of attack. Background concerning the archive and the seemingly endless legal case over whether it can be seized and sold to compensate terrorism victims is here and follow the many links back. ANOTHER BLOG SERIES BY LAWRENCE H. SCHIFFMAN: Second Temple Period Rationales for the Torah’s Commandments (5 posts).